The evil one, dammed be he, was the first anti-Semite because of his hatred for the Holy One, blessed be He. The Hebrews are God’s chosen people; composed of Jews who could be either active Hebrews or just those who claim their place due to their heritage. It drives me crazy when people in Israel are interviewed about miracles, which they acknowledge, and then say they are not religious. In the same way, there are Born Again Christians, and there are those who claim to be Christian without ever having a Born Again experience. Abraham was not only the father of the Hebrew people, but also of the Arab people (not the Islamic/Muslim people because Islam is a man made religion, invented by Mohammad, approximately 600 years after the Birth of the Messiah). Non Jewish Christians, through faith, become sons of Abraham by being grafted into the vine of Judaism. During the crusades Jews were slaughtered, by misguided doctrines under the guise of Christianity, in their synagogues; the same way that Christians are slaughtered, by Moslems, in their churches today. During the Spanish Inquisition, Jews were killed if they wouldn’t convert to Catholicism. Martin Luther, regardless of his accomplishment to bringing about a bible for the common man, was himself an anti-Semite. Writings by President Jimmy Carter, despite his protestations to the contrary, are very anti-Semitic. Replacement theology is a misunderstanding of Gods sovereignty. It is the teaching that the Church of Jesus Christ has replaced Israel in God’s covenants. The actual covenant with the Jews is irrevocable. Adolph Hitler’s grandfather was a Jew and Mahmoud Ahmadinejad was born a Jew. Hitler was ashamed of his Jewish roots and tried to destroy all evidence of it. When Mahmoud was four, Ahmadinejad’s father converted his family to Islam for business reasons. It is a known fact that Moslems build a trophy when they conquer a city or land (or convert something). The thumb in the eye (Dome of the Rock) shrine is a good example of this. This abomination is on the temple mount for one reason only; to claim ownership of the temple mount. “According to Islamic tradition, the (Dome of the) rock is the spot from which Muhammad ascended to Heaven accompanied by the angel Gabriel. Further, Muhammad was supposedly taken there by Gabriel to pray with Abraham, Moses, and Jesus.” Mohammed was not lifted to heaven, along with the angel Gabriel, to talk to the Jesus of the Bible. Isa, the Arabic name for Jesus, is not the Jesus of the Bible. Jesus is God, Abraham’s faith was a faith in the God of the Bible and Moses was a Hebrew. Can you imagine the conversation if Muhammad actually did have a talk with those three. What would Muhammad have to say to two of God’s favorites and God Himself? The Dome of the Rock is a slap in the face to both Jews and Christians. We must realize that under the Moslem rule of WAQF; once a territory becomes Moslem, it is Moslem forever. That would include the Cordoba Mosque, the Dome of the Rock/Temple Mount and the Twin Towers. That is the reason the Moslems want to name the Mosque closest to the Twin Towers, the Cordoba Mosque. 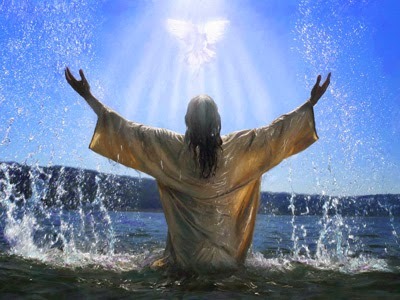 Christians, who are truly ‘born again Christians’, are in essence adopted Jews. The Bible says we are grafted into the vine of Judaism, of which the root is God. There can be no anti-Semitism in true Christianity because Jesus came to the earth as a Jew. 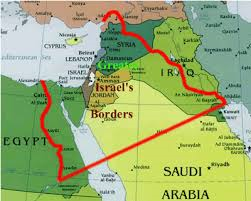 As we can see, from the map above; in reality Israel owns present day Israel, the West Bank, the Gaza strip, all of Jordan, all of Syria, all of Lebanon, part of Saudi Arabia, part of Iraq and part of Egypt. Anti-Semitism is an abomination to the Hebrew people, as well as Christians and to God Himself (who chose them as His own). It’s up to you: God said if we bless Israel, He will bless us, but if we curse Israel He will curse us. That is a promise direct from God.